The American eel (Lat. Anguilla rostrata) and the European eel (Lat. Anguilla anguilla) are very similar, so much so, that it is impossible to distinguish between them. The European eel has on the average 114 vertebrae and the American 107. The Icelandic eel was considered to be of the European origin, but research has revealed both species and their cross breeds all over the lowland areas of the country, especially in the West, South, and Southeast. The size and weight of the eels in iceland depends solely on their exterior conditions and they can reach 1,25 metres length and weigh between 0,1 and 6 kilogrammes. In Iceland the eel is not regularly on the menu, but the Danes and other Eruopean peoples appreciate it both fresh and smoked. The extraordinary history of the European eel starts in the Saragossa Sea, about 4000 kilometres from Europe. The spawning takes place at the depth of 600-700 metres during spring. During the months of March-April, the smallest eel larvae (5 millimetres long and transparent) are found there at the depth of 100-300 metres. The total depth of the sea of the spawning area is 6000 metres. At this stage the larvae, called leptocephalar, is lenticular in shape. The Gulf stream carries them to the north and east toward the coasts of North America and Europe during a period of about one year. When they reach the continental shelf, they keep their transparency and are called glassy eels. They have reach a length of 65 millimetres and the shape of eels. They start entering the rivers of the European islands and continent, first in France, Portugal and Spain in November-December and further north in March-April. The schools can be several kilometres long. The eels swim upriver, conquer all kinds of obstacles, until they find the best feeding locations. High waterfalls are not an obstacle. They either climb the cliffs in the water or on dry land. Some of the eel stock feeds in salty waters of shallow bays. During the first summer, the skin developes black colour and some scales grow deep in the skin. The growth depends mainly on the food and the temperature. 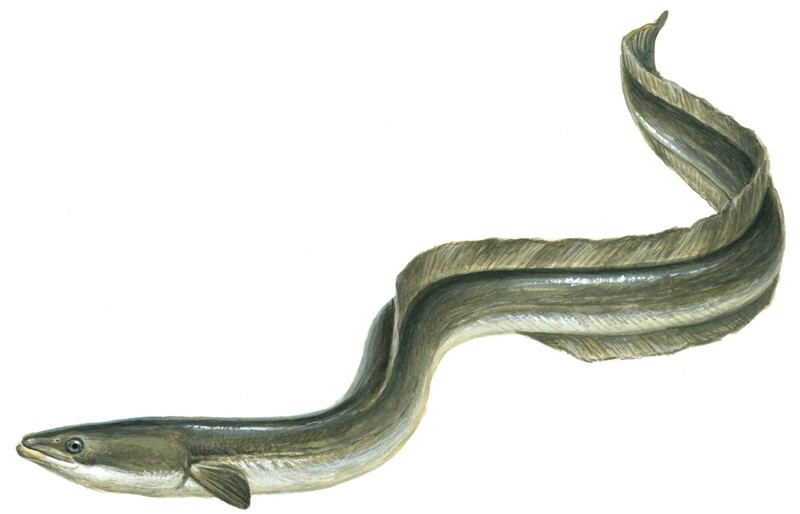 During the first winter after arrival, the eel reaches 8 centimetres length, and 17-19 during the second. Its eyes are small and the snout is wide. The back is brown gray, the sides light lemon yellow, and the fish is very soft to the touch. The eel is a nocturnal animal which feeds on all kinds of worms, shells, crabs, insect larvae, crustaceans, stickle backs, and amphipods. Eels feeding on larger animals are caught on fish hooks and have a wide snout. Eels feedin on smaller animals have narrow snouts. Both belong to the same species, and there are more variations to be found. During winter the eel hibernates where the water does not freeze to the bottom. When the eel has reached 6-7 years age, its eyes grow larger, the snout gets narrower, the skin turnes dark on the upper torso and silvery below. It stops feeding, its intestines shrink, and it becomes hard to the touch. The eels living in salt water all turn into males and the fresh water eels into females. The male metamorphosis starts earlier, i.e. the females usually are 8-10 years old. In September-October the males set off out to sea and their genetials develope in the Saragossa Sea. This development very seldom happens in Eruopean waters. The eel has to cover about 30 kilometres a day to get back to the Saragossa Sea and does not feed enroute (it survives 4 years without feeding in cages). Most biologists are certain, that the eels die after spawning. Where the eels cannot get back to sea, they can reach the ripe age of 25-50 years.